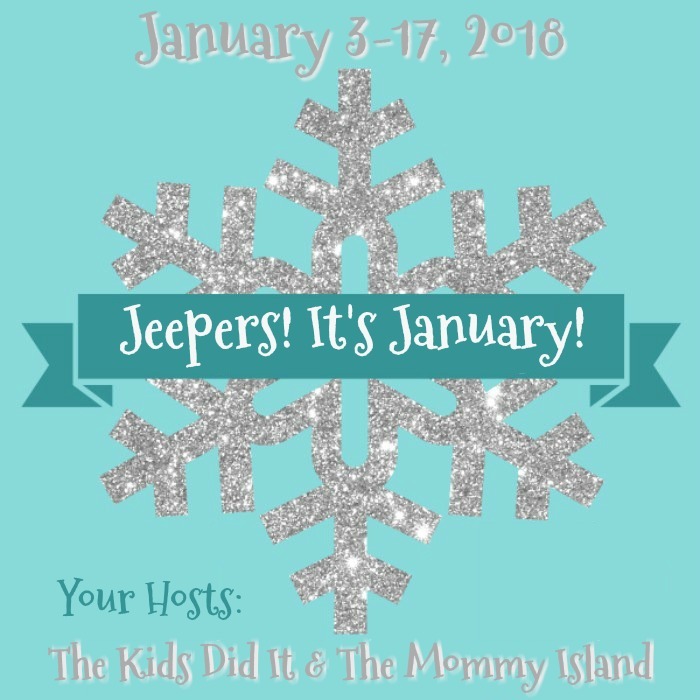 It’s Time for the Jeepers, It’s January Giveaway Hop! 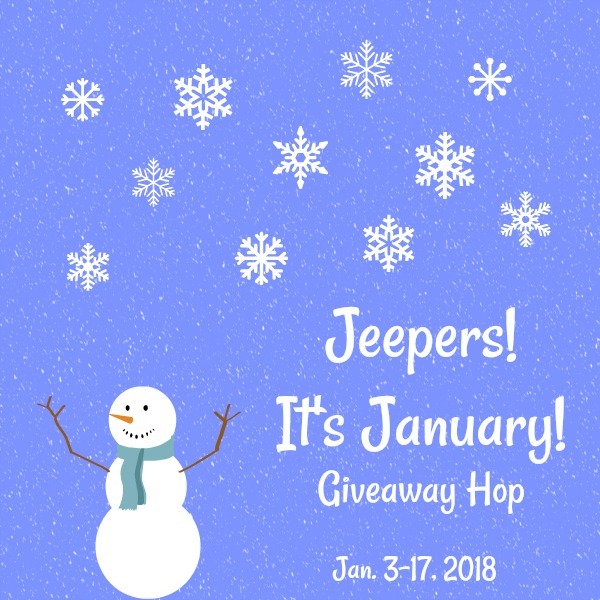 Jeepers, It’s January is the perfect title for this giveaway hop because jeepers, is it cold outside! It’s abnormally cold and it makes me want to hibernate in the house with a nice warm cup of coffee or hot chocolate. And since it’s too cold to go out, it’s a good time to enter giveaways. The Jeepers, It’s January hop has multiple participants so grab that cup of something warm and start entering! 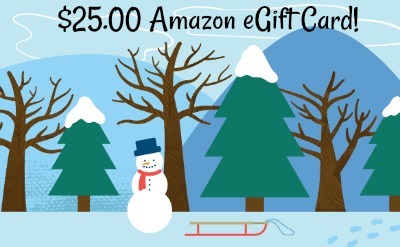 I’m giving away a $25.00 Amazon egift card! I like them all, actually, none more than the other. I love Paypal cash . I prefer giveaways with Amazon gift cards because they’re easy to receive and redeem, and I love to shop on Amazon.com! Love me some Amazon!! We do SO much of our shopping on there!! I prefer giveaways with VISA gift cards. i prefer paypal because we have a paypal card , so it’s like cash! Any of them work for me! They all spend! I prefer amazon gift cards/ecards. I can get anything from Amazon, love shopping there. I prefer paypal cash for giveaways. I prefer giveaways with Amazon gift cards. But, Visa Gift Cards and PayPal are nice too. I love Amazon or Visa GC the best as you can pretty much buy anything you want with them. I prefer Amazon Gift Cards. I like all 3 options. I prefer Visa gift cards and my second choice is Amazon. Paypal would be my preference. Amazon, then Visa, in that order. for me i like both of them but the paypal you can shop in more places on line and i like that a lot. I prefer Amazon gift cards because I can find anything I want on there. I also have an Amazon Prime membership so I get free shipping. Thanks for the giveaway! I prefer giveaways with PayPal cash. My first choice would be a Visa Card but not far behind would be an Amazon card. Both are awesome. I’m happy with any of those giveaways!! I love shopping at Amazon and Paypal and Visa cards are easy to use!! Just grateful for wonderful giveaways!! They’re all great, but I have a slight preference for Visa GCs. I am happy to receive any of the choices offered. Amazon gift cards or PayPal cash would probably be my preferred ones. I prefer Visa or Amazon. I love Amazon gcs because we have Prime and i can order 40 lbs of kitty litter or the huge bags of dog and cat food without having to lug it from the store to the car then the car into the house. When it arrives I just drag it from the porch to into the house. I like Amazon GC giveaways most of all. I do most of my shopping there. I like Visa Gift Cards because you can use them anywhere. I like Paypal because then I can choose where I spend it. It’s easier for me. I like Amazon gift cards or Visa cards to help with my shopping needs. I like giveaways with Amazon eGift cards, paypal cash or Visa gift cards. No preference really, the paypal is great because I can always use it when grocery shopping. Comment and tell us if you prefer giveaways with Amazon eGift cards, paypal cash or Visa gift cards. Visa or Amazon are great! I prefer giveaways with a Visa gift card so I can use it to pay for gas or groceries. I like amazon, then paypal! Thank you! Fist choice would be Visa, Second would be Amazon, Third would be Paypal. I prefer Amazon gift cards!!! I prefer Visa gift cards because they can be used just about anywhere. My first choice is Visa because I can spend it anywhere. If I had a choice, it would be Paypal! My first choice would be Visa, then Amazon, then Paypal. Amazon.ca e gift would be lovely. I like either Visa or Amazon. Both I use quite a bit. PayPal always takes afee, which is odd. Amazon gift cards are great! There is something there for every need. I prefer Amazon gift cards or visa gift cards. Thank you for this generous giveaway. I like giveaways with Paypal best. I prefer Amazon gift cards because you can find anything there! I am a frequent Amazon shopper especially for my grandchildren. I like giveaways with Amazon gift cards since they have a huge selection of items. I don’t really have a preference…I love all giftcards; Amazon eGift cards, paypal cash or Visa gift cards. I prefer Amazon eGift cards because you can get anything, it works for USA & Canada, prices are good, and shipping is often free. I don’t like visa gift cards because of the fees. And with PayPal cash, I have to pay to convert currency or transfer to my bank account. But obviously all 3 prizes are generous and appreciated. I don’t have Prime for nothin’. hahahaha So I’d have to say Amazon. All three is great. The paypal would be my first pick. I really don’t mind any of them – they all spend the same to me for the most part. I would say amazon is my least favorite just because your limited to what you can get. Paypal/Visa I can go buy groceries, laundry soap, etc. with if needed. I like either Amazon or Visa gift cards. I would be happy with any of those choices! They are all easy to use and convenient. Thank you! I am grateful for any giveaway offering Amazon, paypal or Visa gift cards either way if I win, I’m pleased!! I love Amazon, because there is so many different things you can use it for, and it’s hassle free. I do a lot of shopping on Amazon so Amazon ecards are preferable. Paypal cash is best for me! Visa and Amazon are both very nice. I like them both. Prefer visa gc or AGC. I like all of the above, but I lean a little toward PayPal. It’s hard to choose since I like them all. I would probably say Amazon if I really had to choose. Thank you! I prefer amazon gift cards. I always have a wish list running! Honestly, I love all three of those types of giveaways! VISA is probably my most favorite since it can be used just about anywhere! Thanks! I prefer giveaways with Amazon gift cards or paypal cash. I prefer giveaways with Amazon eGift cards, paypal cash and Visa gift cards. I can use any of them. I prefer Amazon. I order most of my gifts from them. Amazon is my favorite place to shop so I like gift cards from there. Amazon gift cards are my favorite! Visa is best because it can be used everywhere, however, I am happy with paypal and amazon also! I like Visa gift cards because they are the most versatile. I like all of them. I do shop on Amazon and have a paypal account. I’m sure some don’t and for those the visa is prob the best. PayPal is probably easiest for me but I enjoy them all. I enjoy the Amazon/PayPal options equally. I don’t care for Visa ones because often those cards are attached with fees. I like Amazon or Visa or any gift card giveaways. Just my personal choice not to get a pay pal account. I like PayPal cash giveaways. I like both the amazon gift cards and Paypal cash as prizes because I actively use both services. Thank you for the chance to win. My favorite is PayPal cash, followed by Visa gift cards. Thanks for the giveaway! I prefer PayPal cash because I can use it to shop in a variety of places. Thanks for the Giveaway chance! I like any of the three but if I have to choose, I’d go with Paypal cash. Thanks. I think I would prefer the Visa gift card. More places to use it. I like Amazon cards the best. My way of getting something for me! I usually like Amazon Gift Cards the best! I like paypal and Amazon giveaways equally! I prefer Amazon gift card giveaways…but any gift card is cool with me. I love the Amazon gift card giveaways. I love giveaways with Paypal cash but Amazon gift cards are nice too. I really don’t have any preference. I like Amazon, Paypal and Visa gift cards equally. I heart the gift card Visa! All are great, but I use Amazon the most! Thanks so much for the chances to win. I love gift card giveaways. Amazon and PayPal are my favorites. I prefer Visa gift card giveaways because they can be used everywhere that I shop. I prefer Visa gift cards. I like the Amazon gift cards! I prefer Visa gift cards or Amazon gift cards. I don’t use PayPal. I like all of them but my favorite would be Amazon e-card. Amazon cards are always nice because you can find everything on there! I like the PayPal Cash the most of all the prizes on this blog and/or the giveaway hop.